Reasons of the heart are different than the reasons of the mind. 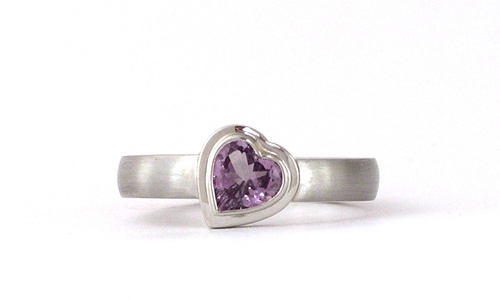 Unconventional heart design by Martinus, featuring a natural spinel in an uncommon violet colour, in a white gold setting. Heart shape Spinel 0.67 ct. 18 karat white gold. Martinus’ Blue Tango captures your desire for simplicity while liberating your passion for detail. Superior design and distinctive in 18 karat white gold, with an intensely blue oval Sapphire cabochon in ideal proportions.Thai Sapphire, 2.55ct. 10,6g white gold 18 karat. 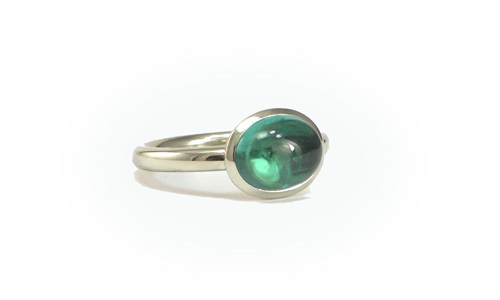 A truly impressive ring inspired by the eternal energy of waves. 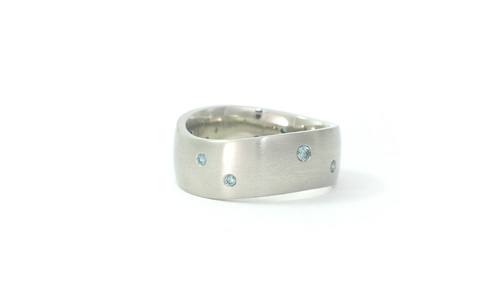 Nine precious, rare blue diamonds with brilliant sparkle seem to dance on this comfort fit band of matte and polished white gold. Diamonds blue/green 0.26 carat. 18 karat white gold. An orange citrine captures golden memories of the day. The round profile silver band finishes the lines with solidity. 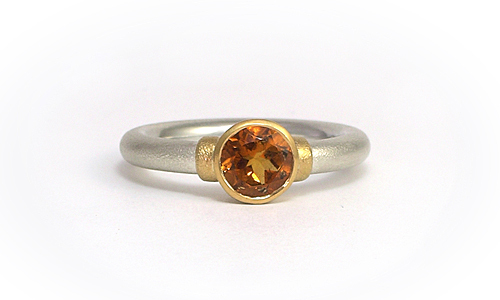 And - another good day is promised.Cherish a lively Citrine of 0.95ct. It is set off in a rich 22 karat gold setting on a classy band of matted Sterling Silver. Clarity, balance, and transparency are the hallmarks of Mozart’s work, where true shape defined his genius. 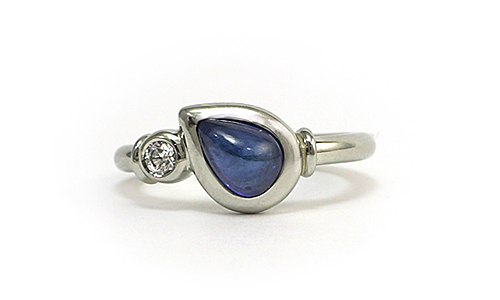 Like a note, freely placed, a smooth pear shaped sapphire cabochon and solitary diamond sing their love song. Understated yet elegant, a soft mauve coloured tourmaline cabochon is elevated in a textured bezel setting and precisely embedded in a tapered ring shank. 7.8g white gold 18 karat. Pink tourmaline cabochon, 5.65ct. Brilliance and comfort! 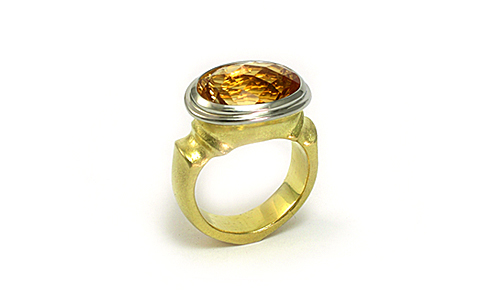 This citrine takes centre stage on your finger. The design speaks of a classic look in its hammer matted and polished surfaces. Arcs and curved lines are reminisced of the golden times of ancient Roman bridges. 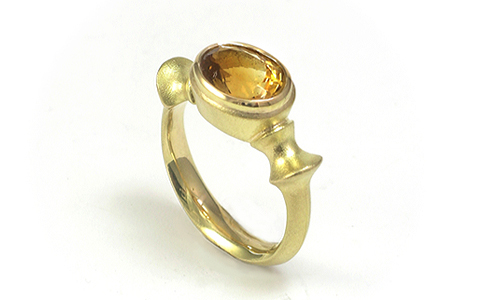 18 karat gold, Citrine, 2.45ct. Tastefully sophisticated! The owl is Athena’s mascot, according to Greek mythology, and at times Athena was said to take the form of an owl. Comfortable, solid craftsmanship in sterling silver and 18 karat yellow gold. The original silver Drachmas were minted in 527-520 BC. Samba nights in Rio! 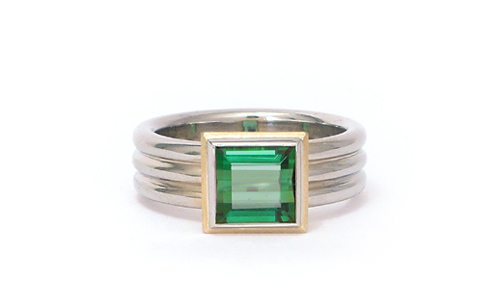 White gold, yellow gold and this stunning Brazilian tourmaline with its fancy checkerboard cut make this ring colourful and festive. Brazilian Tourmaline, checkerboard cut. 2.10ct. Vivid color, an impressive gem and strong design exude a genuine confidence. A one-of-a-kind sculptural composition in highly polished white gold. 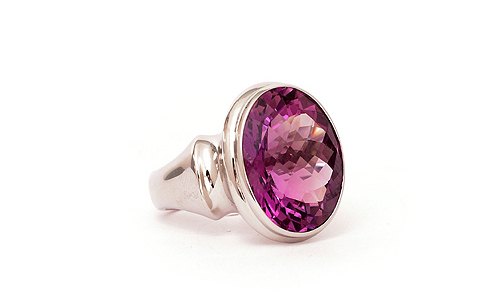 Amethyst checkered board cut oval 17.03ct, 18 karat white gold. The essence of the West Coast rain forest is captured in a remarkable Martinus design. Real natural tree bark is translated into subtle, golden textures. Glistening, polished rims frame this tapered band. Impressive! 18 karat rose gold colour enhanced. Cut to royal perfection, a spectacular, legendary green tourmaline evokes the Gardens of Versailles. 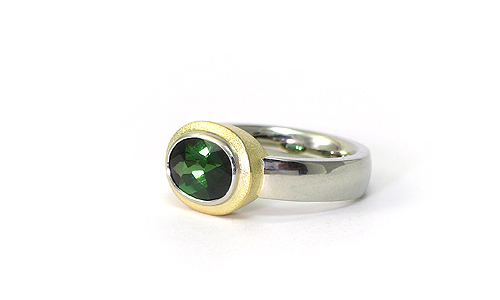 18 karat white and yellow gold are combined with a faceted tourmaline 2.40ct. If you ever owned a Gemstone, this coloured crystal is dating back millions of years. How does it affect your feelings? For such a crystal to become a jewel, it needs cutting along the crystals length, or across the top. Doing this is a profession on its own. We buy and source well cut gems from responsible cutters. With total focus on gem quality we take pride to provide the metal work around it. We fancy the clarity of a shape and the elegance of a line. 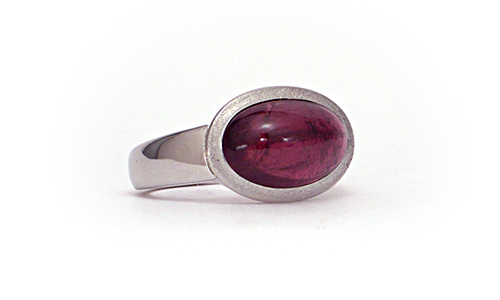 Considering polished or matted surfaces, we fabricate gemstone rings in three colours. 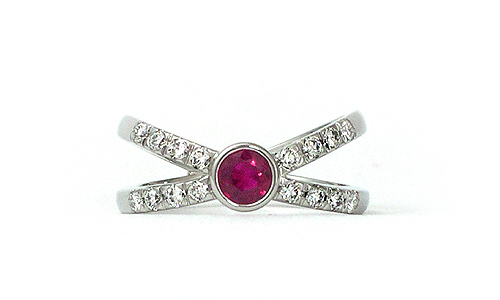 Rose, yellow and white gold are melted here in our studio. As the proprietor and Master Goldsmith, I want you to choose well. Eight years of training and decades of hands-on knowledge in the field can be yours! Ask any question! Have a look at my work and let me know what you marveled at.